If your customer experience is bad, your product is bad. You get churn, and you lose money. But if you can build a great experience for your customers, helping them achieve success even outside your product, then you will have customers that will retain and expand alongside you. That is what Katie Rogers has been building at Salesloft. Katie, VP of Customer Success at the Atlanta-based SaaS company, was employee #7 at Salesloft and the first customer experience hire. Tasked with scaling the post-sale part of the business, she has led to the team over the past four years, growing the customer experience team to 40+ and building the framework for Salesloft's 16 customer success managers to reduce logo churn by 175% and increase net revenue retention by 1200%. Her secret: great people, great knowledge, and a constant desire to grow. People like to do business with people. In low-touch SaaS, you can go the entire lifecycle without ever conversing with a human being. But at that point of frustration, when your customers are lost, not getting their value for money, and about to press that cancel button, you need to get on the phone. Ninety percent of churned Salesloft customers were happy to talk and gave reasons that would not have been obvious from the data. All this information was readily available, but nobody had asked them before. All it took was for Katie to pick up the phone and the company had a massive resource to fight their number one issue. Hire your weakness. Your team, both company-wide and the customer-success, won't be capable of everything. Look for where you are weakest and hire for that position. At Salesloft, they were weak in customer success, so hired Katie. Katie then hired for her weak spots to round out the team. Create a kb. High touch is great but suffers at scale. Resources such as webinars, content, and knowledge bases can all decrease the load on a nascent customer success team. Define your metrics. Like any other team, customer success needs a way to know how well they are performing. Defining volume early allows the team to start to build processes to lower volume and increase happiness. “When we brought on the SMB component, we really started to create one-pagers and give assessments in the hiring process that specifically spoke to this type of business. What do you know about SMB companies from a sales strategy perspective? What value can you bring to drive their business?" Building a relationship is great, and a vital component of a great customer success hire, but your hires need to add value to customers. The Salesloft hiring process looks at whether they could advise customers, not just on how to use Salesloft, but how the customer could improve their sales strategies overall. In this way, the customer success team is acting as the consultancy arm of Salesloft, making them even more integral to their customers. The people that are capable of this are the ones that are still part of the team today, helping hundreds of sales teams across the globe be more successful. 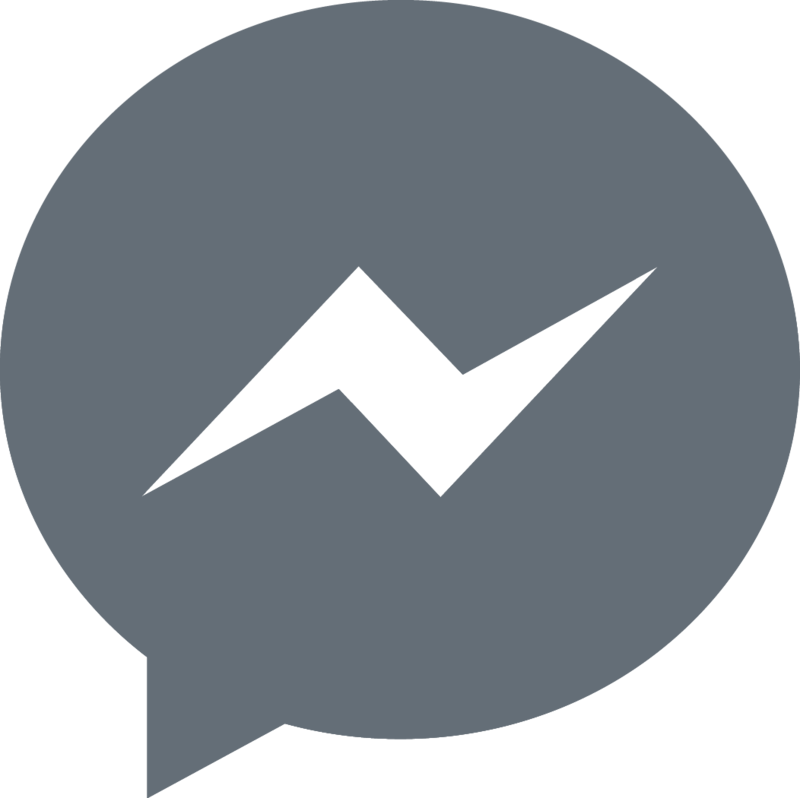 The other component of a successful 2015 was digging deeper into churn. 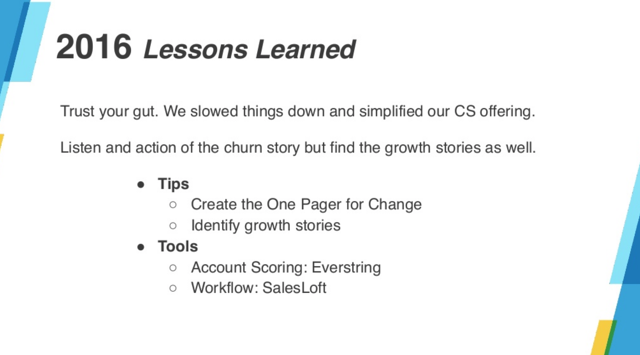 Now that Katie and her team had an understanding from customers why they wanted to leave, she could start to look at how churn related to the customer lifecycle and build a wider story about Salesloft churn, the reasons, and what they could do to start fighting back. 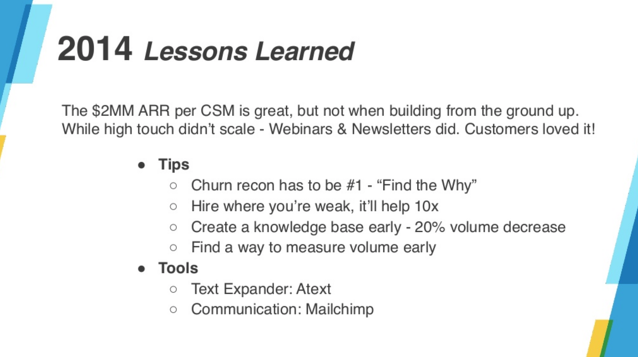 Cutting out the reasons for churn is vital. But any product is about building a machine for success. You need to know what makes your most successful customers a success and repeat that at scale. Taking time to look at the reasons for success it an important part of customer success. Katie could then feed that information back to her team, who had been hired to make the customers a success. By finding what works for the best and spreading that knowledge around, you can not just cut churn, but expand their business as well. The other big learning for Katie for the year was that the customer success team could be a driver for change. As she wanted to simplify the customer success offering, she put it bluntly to her boss: budget needed, team needed, time needed. But most importantly, what she would be giving back with the change. 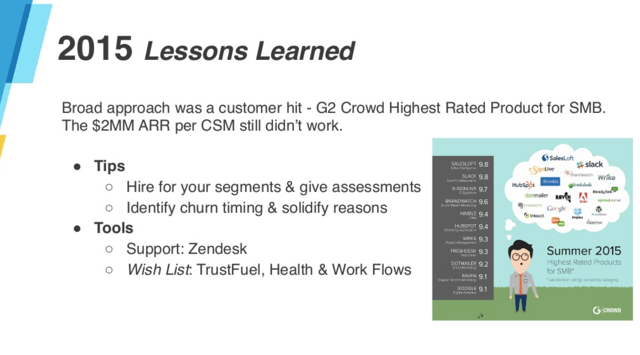 The company 2X their ARR that year with a growing customer success team, showing how much this team could lead the company from the front. In 2014, there was no segmentation. Katie was the single point of contact for 400+ customers, no matter what their size or what their problems. 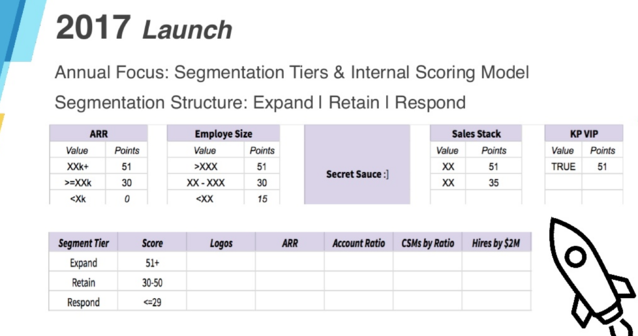 In 2016, when Katie rebooted the team, the segmentation started to take into consideration revenue and organization size, with key accounts being those that were either over a revenue limit or had a certain revenue and a certain number of employees. Expand. These are the key accounts of old. High revenue, large companies that are finding success with Salesloft. To keep them, Katie and her team have to constantly add value. But she knows that as they grow, they will use the product more and more and expand their account. These are the growth stories that Katie wanted to identify and scale to other accounts. Retain. 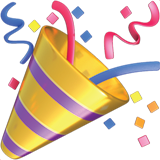 Smaller companies that are still doing well with the product. These will be the “Expand” accounts of the future so the team concentrates on retaining them and adding value where they can find it. Respond. Smaller companies and those that are struggling with the product. These are churn stories in the making. But by “responding” to their issues, the customer success team can help them find success and start to grow.